2016 RGS National Hunt - Grand Rapids Minnesota - 5th Place Division 1, Brad & Eddie - at least we were in Div 1. 2015 RGS National Hunt - Grand Rapids Minnesota - 4th Place Division 3, Brad & Eddie - we know we're not as good! 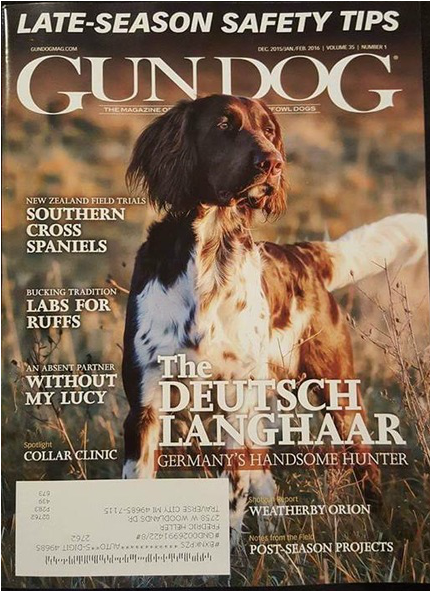 Gun Dog Magazine December 2015-February 2016 Issue "Labs for Ruffs"
Career-long newspaper outdoor writer with long-time gigs in Mississippi, Texas and Michigan. Took early retirement in 2007. Thousands of magazine credits over a 35-year period including Bassmaster, Outdoor Life, Field and Stream, Salmon-Trout-Steelhead, American Angler, American Hunter and many more. Currently writing a weekly, self-syndicated hunting and fishing column in Michigan. How old to be a legend? It depends, I suppose, on your field of endeavor. Athletes can attain legendary status at a relatively young age. Hunters and anglers? Well, I generally look to see a little gray in the hair before conferring the honor. But I could be wrong. Because when it comes to grouse hunting, the Heller brothers — Frederick and Ric, aka Fritz and Junior – are as good as any, even though neither is even approaching 40. There are a handful of reasons why the Heller bros outshine most other grouse hunters. They’ve got it all – knowledge, dedication and desire -- but what makes them stand out is that they do things differently than many. Need a for instance? Well, in a world where there are two kinds of grouse dogs — English setters and the other kind — the Heller's are in the latter category. They hunt with Labs. In a game that seems perfectly designed for pointing dogs, the Heller's use retrievers. The guys obviously spend a lot of time with their dogs (they are marvelously well trained) and that, they say, maximizes their opportunity. They can redirect their dogs with a simple whistle — one means turn, two means stop, three means return — so they’re never out of habitat. “Our dogs are in the best cover all of the time,” Fritz said. True. And Junior points out a couple other little advantages. “When you’ve got a pointing dog working a hundred yards out and he goes on point and when you get there and flush a woodcock — that’s 10 minutes you weren’t actively hunting grouse,” he said. on a particular food item, they’ll spend the day in that habitat — even if the forest types are a long distance apart — until it fails to produce. Then they’ll adjust. And the Heller's notice small variations in habitat that most folks wouldn’t even see; it’s the kind of attention to detail that pays off with birds. Their youth helps them in one department that I think many sportsmen overlook — stamina. There is a direct correlation between the amount of ground you cover and the number of birds you flush. These two cover ground at a pace that would put a lot of endurance athletes to shame. Fritz once told me they average three miles an hour in the woods. (Have you ever tried to average three miles an hour on a treadmill for hours at a time?) Don’t believe him? He’ll show you the GPS. I know when they take me, they often put me outside of the thickest cover so I won’t slow them down (and I get through the woods a lot better than most guys my age). It’s a challenge to keep up with them just walking down a two track, let alone fighting the shin-tangle and tripping over deadfalls. Finally, there’s one other characteristic that sets them apart from a lot of grouse hunters: They hit what they shoot at it. The Heller's keep fairly detailed records of their hunts and Junior’s most recent log shows he’s killing about three out of four grouse he shoots at. In a game where one for three is probably average — and I know I’m quite happy to shoot 50 percent — that’s pretty stout. I could go on, but I’m afraid that if I do, I’ll start spilling some secrets that the Heller's would rather not share. And I’ll not do that. Not everybody has the opportunity to go afield with legendary sportsmen. It’s a situation I hope to take advantage of again very soon. Rub, my English setter, was busy as usual, working through the waist-high bracken ferns in a mixed aspen-cherry stand when he slammed on point. I took two steps toward him and a grouse rocketed out of the cover, maybe 25 yards away, headed toward a young pine thicket. I wheeled and slapped the trigger, just as the bird disappeared behind a pine. I really didn’t know; I felt good about the shot, but couldn’t see whether the bird had fallen. Rub, who works at a frantic rate anyway, was going nuts, but to no avail. Heller brought Jones – one of his Labs, named after a fishing hole on the Betsie River — over to the area. Jones was on it like a short-seller on a company with disappointing earnings report. brothers’ Labs are some bird-finding fools. It was my first grouse of the season (on my first hunt, too) and I was the last of our foursome to score. Two hours into it, we were all in the plus column. Excellent. I’d had a chance earlier, on a fast-parting grouse that I never got on until too late. Everyone else had made at least one of their chances count. It was what looked like a fine morning that intersected with rain just minutes after we stepped into our first cover. We flushed seven grouse on that first jaunt; Matt Mates, Fritz’s long-time buddy (with whom I’d hunted a number of years back) scored a fine red-phase grouse and, as we doubled back towards the truck, Fritz killed a bird, too. On the next course, through some low-lying ground in a thick-as-a-brick alder stand, Ric put one into his game pouch. Meanwhile, we were flying birds at the kind of pace that makes one conclude we are at – or at least very near – a peak in the population cycle. And, as is usual in early season, many of them were out of sight immediately or shortly after they flushed. The trees were still fully leafed (and largely still green) and there hadn’t been enough weather yet to beat down the bracken ferns. Those conditions slow down most mortal grouse hunters some, but never seems to bother the Heller's, who are grouse-hunting machines. I’ve been bird hunting with the Heller boys – both Traverse City-area residents in the hospitality industry – for about a decade now and have never failed to be impressed by their routine. They hunt hard, cover lots of ground, find lots of birds and kill at least their fair share. The Heller's hunt with Labs, which is something I don’t do so much anymore as my tired old legs won’t let me keep up with them like they used to. These guys move through the woods as though they were recreational walkers covering the floor at a shopping mall. Nothing slows them down. their partnerships with their humans. Fritz says they cover the woods at three miles an hour and I think, if anything, he’s underestimating their speed. When I hunt with them, they usually assign me the outside edge of the cover, for which I am quite grateful. As the day progressed, the sun came out, the wind picked up a little bit and the woods began to dry out. And our bird-finding slowed. We hunted through what looked like ideal cover with just one variable missing – food. Although there was plenty of cherry and thornapples in the cover, there didn’t appear to be any fruit. Only the autumn olive sported berries and even that was spotty. Autumn olive was the only fruit we found on a day in the north woods. already – have been full of leaves, acorns, and little else. In early afternoon, after a trip through some fine-looking aspen bordered by fruitless autumn olives, we took a break, Mates reported that we’d flushed 26 grouse (and 11 woodcock, though that opener was still a day away) not counting a couple of birds he deemed were reflushes. We were four hours into it; figure three of those on the ground. That morning at breakfast, Fritz said he was hoping we’d move seven birds an hour. Depending on how you count time (and birds), we were either just short or well ahead of that. As the crew planned out the afternoon strategy, I begged off. I can’t keep up with the youngsters anymore. But I came away with two impressions: The Heller's are as good as ever and it looks like we have the makings of another excellent grouse season. I caught up with the Heller brothers for a second day of grouse hunting this season, as I’d hoped I would, just days before the firearms deer season opened. As we headed into the first cover of the morning, Fritz – the older brother – pronounced that this was the kind of cover the pair never even considered until late in the season, as it was just too thick. And, indeed it was. Blackberry brambles intertwined with goldenrod among the aspens. Had to fight your way through it. We flushed nine grouse in about 45 minutes. Ric, the younger brother, killed one. therefore has a little more time to hunt than his married brother Fritz – killed 107 ruffed grouse. This year, he was at 103 by deer season. So I let the younger Heller do the talking about their approach to later-season grouse hunting. The key, he said, is understanding later-season grouse cover. “Later-season hunting is a lot different -- your foliage is down and your sight plain is so much better,” he said. “Food sites are always a benefit, but when the leaves are down, food really seems to hold them. I noticed, throughout the day, that we spent a lot of time in goldenrod (among the aspens), a lot less with dead ferns carpeting the forest floor. But I also noted there were a lot of young conifers around. Ric said that was a key. Having flushing dogs (Labs) instead of pointing dogs plays into making this approach work. If you have a pointing dog, where you have to flush the birds, you have to get right on top of them to do so. In thick woods – like young conifers – you can let the dogs do it for you. But you’ve got to be able to stay up the dog(s). And that’s where the Heller's really have it together. it’s like a pointing dog relocating. Which led to the next question: Are the Heller's killing too many birds for the resource? “As a conservationist, it's in the forefront of my mind and Fritz's mind,” Ric said. “But that's why we continue to find more and more covers. And we’re very conscious of not shooting too many birds out of any one cover. If we've had a good cover that we shot a few birds out of early in the year, we won’t go back there late in the year. The birds always have to be in the forefront of their mind. You have to leave enough birds to provide seed for the next season. We hunted until early afternoon, and then called it a day as Ric had to go to work. We’d each killed one bird, which, for the Heller's, was a relatively slow day. Meanwhile, weather allowing – and it’s awful hard to hunt grouse in foot-deep snow -- the Heller's will continue to chase grouse through December, when the country they hunt changes even more. “It’s one of the most enjoyable times to be in the woods,” Ric said. “The weather’s finally cold enough that you can stay out there without getting overheated and your dogs can go all day without overheating. “Let me email you some dates and we’ll see if we can’t get out at least once in December,” he said. As a reporter I think it’s my duty to do so. Don’t you?